In a previous video I said that loose two strand twists were proving to be a really easy go to protective/daily style, and they were until I came up with another way of reducing the time I spend on my hair, easing the process of detangling and further protecting my fragile ends. And this is it. A semi flat twist style- yeah, not anything amazing but extremely helpful to me in my weekly routine. Check out my video to see more! Hi everyone, I hope you are all enjoying your summer! if you've been looking for some new hairstyles to try, look no further! Check out my feature on 4Chairchick.com where I show you how to do 3 really easy styles for your summer events. And if you're at all interested in the accessories shown in the video, check out my etsy shop where I have lots of handmade hair accessories in the 'Verano' 2014 collection. Enjoy! Protective styling is to style your hair in such a way so as to protect or conceal the ends of your hair. The ends are the very oldest parts of your hair and tend to be the driest and in need of the most tlc. Protective styling comes in many forms such as twists, braids, buns, weaves, wigs, pin and tuck styles and also styles which incorporate scarves or head coverings. I have found there are two main benefits to protective styling for my hair texture. When I do a protective style I find that my hair stays moisturised for longer. If I properly moisturise and seal my hair with a heavy butter (e.g shea butter) I can go for days without adding any more moisture to my hair. When hair is properly moisturised it is less likely to break. When wearing a protective style I find that I retain more length. This is probably for two reasons. Firstly because I am not manipulating my hair everyday therefore there is less chance of breakage occurring. Secondly, my hair is not repeatedly exposed to the weather elements or to garments and accessories like woolly scarves I might be wearing. As I mentioned earlier there are a range of protective styles you can do. I prefer not to use weaves, wigs and extensions for a number of reasons. Firstly I don't like to go to the hairdressers. I like to do my own hair as I know exactly how it should be treated. I also like to save money and time and I find going to the hairdressers (for me) wastes both (unless of course it is a special occasion). This is my ultimate protective style at the moment. Loose two strand twists are just like the regular single twists , but looser. The looseness makes my hair look fuller which I prefer. I don't have the problem of the twists unraveling as I really twirl and seal my ends well so they stay put. Moisture retention is good with loose twists, but if my hair does dry out I simply spritz and seal my hair without the worry of shrinkage and tangles. 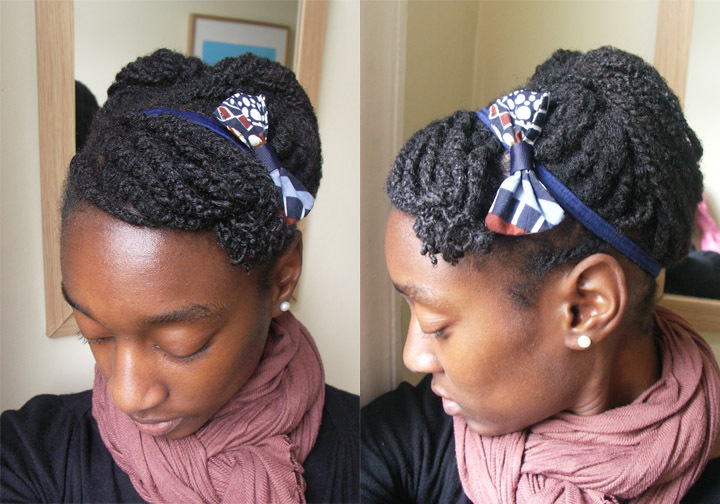 I can also wash my hair while in this style and re-twist to neaten as and when I have the time. Which means if I don't have the time to re-twist all the twists in one go I can re-twist a section each day while still wearing the style. Loose twists allow for versatility of styling during the week and there is absolutely zero manipulation in the morning. I simply throw a hairband or hair accessory on and go. The longest I've gone without re-twisting is about 8 days but I could easily carry this style for two weeks or longer if I re-twisted it. The only down point to this style is that it is essential you do not wash your hair too many times while it is installed without re-twisting, or else you might end up with locs! I usually wash my hair once or twice and then I make sure I either take down the twists or re-twist. I tend to flat twist the back area of my head while chunky twisting the top and front area to allow some versatility of styling each day. Pros are that you can easily carry this style for days without having to re-do the whole the style each morning hence reducing manipulation and breakage during the week. The moisture retention is very good when wearing this style. A tuck and pin style is simply when you tuck sections of your hair and pin them down. What I love about this technique is that you can very quickly create some really lovely shapes and designs. All that is needed is a comb for parting and bobby pins. This technique works best on stretched hair. The downside to this style is that you will need to re-twist or stretch your hair each night and re-do the style in the morning. This means that you are manipulating your hair everyday which could increase the chance of breakage. Also, another issue I've discovered is that moisture is easily lost when my hair is stretched and left untwisted or braided. I guess this is because the outer cuticle layer is slightly lifted as a result of the hair strand being stretched into a straighter shape, this therefore allows for moisture to escape a little easier. What protective styles do you like to wear? Which are best for moisture and length retention for your natural 4c hair. Leave you comments below!